At Perşinari (village in the commune of Văcăreşti, Dîmboviţa county, near the town of Tîrgovişte) a golden sword and some small silver axes were discovered in 1954 and in 1962 eleven dagger shaped objects. In 1977 some fragments from another dagger were also recovered. The daggers had not been completely finished. The daggers and the sword have one central nervure. At the sword the nervure is separated in several fibers toward the handle. The handle and the tip of the sword are missing. The blade (the only part of the sword preserved) is 289 mm long, 119 mm maximum wide and 1.4 kg. The daggers have lengths between 187 and 235 mm, the weight being between 223 and 505 grams. It is possible that these golden objects were parade weapons, resembling some gilded bronze weapons unearthed at Mycenae by Heinrich Schliemann. The historians believe that the hoard can be dated in the middle period of the Thracian Bronze Age, 17th-15th century BC. Mr. Octavian Iliescu is the author of a paper published in the volume Cercetări numismatice VII (Researches in Numismatics, issued in 1996 at the National History Museum of the Romania) "How the primitive money looked. 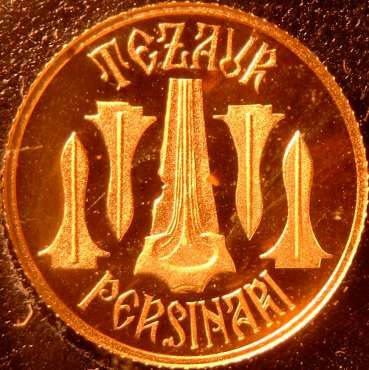 The Perşinari Hoard" (Romanian article), from which we took the following information. 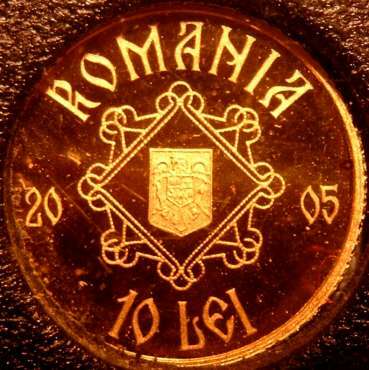 In this paper the notorious Romanian numismatist presents very serious arguments that show that these golden ingots are primitive moneys, that were used as coins. The 11 daggers were classified in four classes, based on size, weight and fineness of the gold used by the goldsmith. The objects discovered in 1962 were transported to Bucharest, at the National Bank of Romania, and were considered as dental gold! The daggers were saved from melting by Mr. Octavian Iliescu, who identified them as Bronze Age objects. In 1963 they entered in the collection of the Numismatic Cabinet of Library of the Academy. Today the daggers are displayed at the National History Museum, in the Treasury Room.